Playing out like an audio-only E! Hollywood Story for the preschool set, this fictitious tale of a wayward musical genius, who also happens to be a monkey, is as original as children’s entertainment gets. Phineas is a banana lovin’ guitar wizard who has attained an insane and unwanted level of fame which has him itching for a change of scenery. His live performances are a sea of Beatles-esque screams from the crowd, making it impossible to hear his music. As a result he ditches his home, his fans and his fame to reconnect with his passion, the music itself. After a bit of table-setting, this is where our peek in on the life and times of Phineas McBoof commences. His efforts to stay under the radar, however, prove to be short-lived. Along the way on his nautical adventure he meets a crazy collection of fine players and forms The International Band of Misunderstood Geniuses. The band goes on to become world famous, propelling Phineas back in the public eye. The dialogue and interplay between the characters is charming and funny. The story, in addition to being extremely clever, also teaches listeners about the instruments being played, the sounds each makes and the variety of musical genres employed by the Misunderstood Geniuses. Oh, and there are terrific songs as well! The story is so endearing and funny that the music can be overshadowed but shouldn’t be at all. 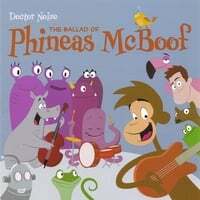 You will enjoy the musical adventure of The Ballad of Phineas McBoof as much as the story itself. With a new CD (The Return of Phineas McBoof) and storybook due this fall, one can envision Dr. Noize’s creation becoming as adored as Morgan Taylor’s Gustafer Yellowgold. Listen to the entire album (from CDBaby)!